YOU are an expert. Yes, YOU! If you want to succeed in your business, you need to claim this, own this, BE this. So often we think that what comes easiest to us is easy for everyone else. That couldn’t be further from the truth! There are things that you love to do, that you lose track of time when you do, that you love to talk about to others. Those are the things that hopefully you’re building your business on, and those are the things that you’re expert at. Or maybe you’re thinking “Yeah Karen, but who the heck needs me to make their eggplant parmigiana?” Let me tell you, people DO. I happen to make an excellent eggplant parmigiana, but I’m busy. So even though I CAN do it myself, I would very likely pay you do make it for me on my busy weekdays. That makes YOU the expert, YOU are the one I’m coming to when I’m hungry. Sounds silly but you can take this same concept and apply it if you design websites, if you’re a health coach, if you’re a personal trainer, if you sell widgets. YOU are the expert and you need to own that. The first place you want to do this is in your LinkedIn Headline. If your headline says something like “Accountant”, I want you to stop reading this right now and change it up. Click here to watch a short video I created a few months ago that shows you exactly how to claim your expert status in your headline. Make sure your headline makes you feel just a big queasy. Put yourself out there in a big way! No one is going to think “she must be even BETTER than she says”. In order to get clients, your headline needs to make them feel as if they’re in expert hands. 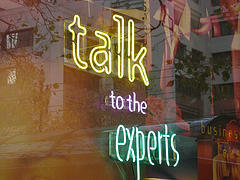 Keywords are important in establishing your expert status. You want to be consistently using the same keywords throughout your LinkedIn profile, leaving no doubt to your readers that YOU are the expert on those topics. I want you to consistently be building social proof of your expert status through strategic use of LinkedIn recommendations. How, you ask, do I get other people to recommend me? Strategy. Each week, recommend someone else, someone that might possibly recommend you back. When your clients send you a nice note via email or a Facebook post, reply back thanking them, and asking them if they would mind sharing it as a LinkedIn recommendation. I bet they’ll be happy to. Share those recommendations all over the freaking place. There’s a WordPress plugin that will rotate them on your website. Schedule Facebook posts sharing recommendations. Brag about them in your newsletters. You get the picture. LinkedIn is the first place you should go to establish your expert status. Once you do, you’ll start to see your business changing, you’ll be asked your expert opinion and you’ll see opportunities to grow. Comment below, share your LinkedIn headline with me. If you want, I’ll review it and make suggestions. Let’s all celebrate ourselves for being the stars we are! Don’t forget to connect with ME on LinkedIn. I’ve never shared my recommendations! That’s something for the New Year’s resolution list! Thanks great post, so much food for thought. My pleasure Rosie, I can’t wait to see all the wonderful things people are saying about you! I’ve just bookmarked this post. Thanks, Karen and I’m looking forward to your expert eyes on me and my biz during our 1:1 calls! I feel like I found the person who will be able to help me sort my social media scene out. Thanks Karen. Linked In is something I haven’t yet attempted, but it’s on my list, so this post offers me some very valuable information. Marg why not? It’s a great place to get new clients! Keyword strategy is critical to being FOUND on LinkedIn. Let me know how you make out! YAY! I love that saying, it’s my 2014 mantra as I help my clients build their expert status. Ah, I’m still so behind when it comes to LinkedIn! Here’s my headline for Twitter, etc. : “California Girl with Midwestern Roots. Coach to the (R)Evolutionary. Meaning Maker. Flower Picker.” It’s sort of a combination of professional and personal. But for LinkedIn, it should definitely be more professional, I know. Progress is all we can do! I love it. Great Marie! I love the headline. I am still working on this Linked In project I rewrote my profile after getting some really great info from Rosie she took the time to point out what I missed it will really help. I still want to get my wife to proof the profile and she is great at helping with that kind of stuff. I was serious about LinkedIn stars needing video to save clients time learning how to navigate Linked in better. Not all people are that good at simple things you take for granted. I need to change the summary for sure. Would love your thoughts. Thanks! Tandy your profile is awesome! I do have a suggestion. Where you list your website, go in and edit that, and choose “other” instead of “Company Website”. This gives you a way to make it more descriptive, and maybe get more clicks to it. Maybe”Inspiring Greatness”. You might also consider using all three available, using “other” in all cases, and point to specific pages, like “About Tandy” and link to your about page, and then the third maybe to something you’re promoting.